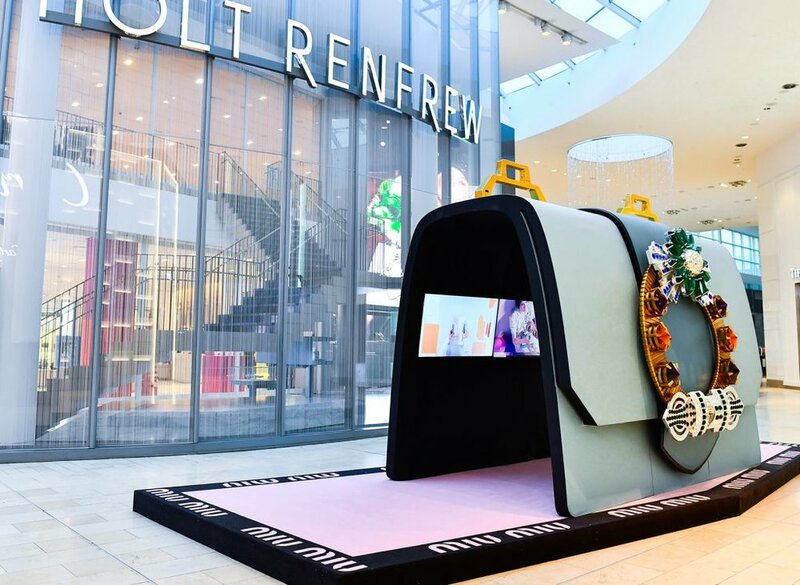 Miu Miu Installs Gigantic Handbag at Yorkdale’s Holts: Luxury brand Miu Miu (under Prada ownership) has just unveiled a playful installation in front of Holt Renfrew at Toronto’s Yorkdale Shopping Centre. It’s part of a promotion for the Miu Lady Bag, which is carried in the recently relocated Miu Miu shop-in-store concession at Holt’s. The ‘handbag’ is so large that you can walk right through it — inside are video screens playing a series of short films to promote the story of the Miu Lady bag. More photos can be found here on Yorkdale’s website, and the installation runs until November 15th. Miu Miu recently unveiled a new boutique on the ground floor of Holt Renfrew at Yorkdale, sporting a blue interior similar to the Miu Miu boutique at Nordstrom at CF Toronto Eaton Centre that opened last year. Holt Renfrew continues to renovate parts of its Yorkdale store and is adding new boutiques and expanding others, with some big announcements to be made in the the coming weeks. Innovative Downtown Oakville Pop-Up Initiative Secures 1st Pop-up: Downtown Oakville has 8 dedicated retail spaces that are being animated with temporary tenants, in an effort to build further buzz in the community’s beautiful downtown core. 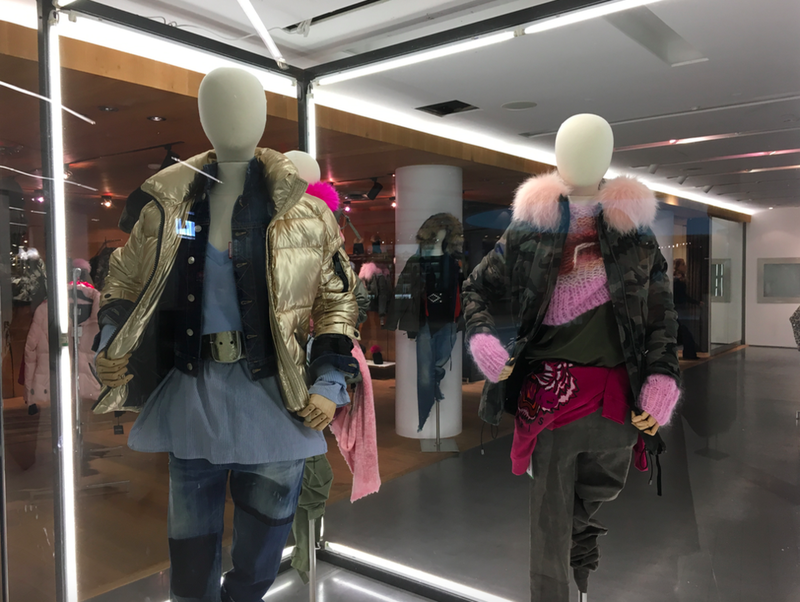 The partnership between landlord Bentall Kennedy and innovative facilitator pop-up go (spelled lowercase) has announced that two fashion designers will be doing a month-long pop-up. Designers Angela Huntington (of brand HUNTINGTON) and Andrew Majtenyi (of brand By Andrew) are known for their Canadian-made brands with British flair. British-born designer, Angela Huntington, aims to create bold yet sophisticated wardrobe essentials in her HUNTINGTON collection. Andrew Majtenyi, as seen in British Vogue, and his collection By Andrew, bring a runway quality to the retail scene of Downtown Oakville. With the help of pop-up go, both designers have launched their pop-up to strategically access one of the most affluent locations in the Greater Toronto Area — an impressive 47% of households earning an annual income of over $100,000. The four-week-long activation will help both designers test consumer demand and expand into a new market. MINISO Opens at Park Royal: Value-priced Chinese retailer MINISO, which positions itself as a Japanese lifestyle brand, has opened its newest Canadian store at West Vancouver's Park Royal. MINISO is already a hit with consumers in the Vancouver area, after having opened several locations this year. The company has also just opened its first Ontario store at Pickering Town Centre, and MINISO has said that it plans to eventually operate as many as 500 stores across Canada. MINISO could potentially take market share away from homegrown retailers like Dollarama and others. There's an excellent article in Maclean's discussing MINISO and how it could impact Canadian retail, where Retail Insider's Craig Patterson is also quoted. Bayview Village to Host November Pop-Ups: Toronto’s Bayview Village centre will see the Detox Market and MoRoCo Chocolat open individual pop-up locations in early November. Both will open in the mall’s ‘East Lobby’ adjacent to Pusateri’s Fine Foods, and be open for several months. The Detox Market is a Toronto-based retailer that specializes in eco-friendly brands in beauty, wellness and health. MoRoCo Chocolat is a popular Toronto-based artisan chocolate maker, known for its unique designs (its chocolate stilettos have been a hit with shoppers). Toronto’s Bayview Village is one of Canada’s most productive malls in terms of sales per square foot, which shouldn’t be a surprise — it’s also located in one of the wealthiest areas in the country, and benefits from convenient highway and transit access. NYC designer SAM. Launches TNT Shop-in-Store: Last week, Suzanne Schwartz, Head Designer and Chief Creative Director of SAM. was in Toronto to showcase her line of fashion-forward outerwear for men, women and children. Innovative multi-brand retailer TNT The New Trend has provided SAM. NYC with a dedicated retail space in its Yorkville Village store, with visibility from the centre’s ‘Oval’. The SAM brand launched in 2011 by the original creators of the Andrew Marc Brand, Andrew and Suzanne Schwartz, and its name is derived from the initials of two, Suzanne and Andrew Marc. Jackets in a variety of colours feature multi-functionality, as well as ample use of fur in some styles. Galerie de Bellefeuille Opens at Yorkville Village: On Wednesday night, there was a grand opening for the stunning new Galerie de Bellefeuille at Toronto's Yorkville Village. It's the first Toronto location for the Montreal-based gallery, and a fourth for founders Helen and Jacques Bellefeuille, who have over 40 years of experience in the art industry. The owners strive to highlight internationally acclaimed artists and the Toronto gallery offers works by artists like Damien Hirst, David Drebin, Jonathan Siliger and more in the 5,000-square foot space. Jeff Berkowitz of Aurora Realty Consultants negotiated the deal on behalf of Galerie de Bellefeuille. The gallery is sure to be a hit -- Yorkville is a high density, affluent area and Yorkville Village and the adjacent area continues to add luxury boutiques. Next week we'll be announcing a 6,500 square foot flagship location for a luxury brand opening on Yorkville Avenue. Structube to Build Massive Warehouse: Montreal-based value-priced furniture retailer Structube is going to be building a massive 650,000 square foot warehouse in Laval, near Montreal, at a cost of $80 million, according to a report in La Presse. 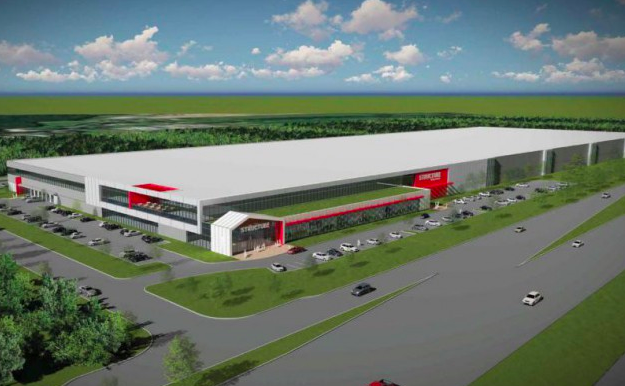 When completed, it will be the largest warehouse in all of Laval. The La Presse article notes that the building will include a 40,000 square foot retail space as well as offices for administrative employees. The company is growing and ran out of room at its current headquarters. Structube is planning to enter the United States in 2018 and as well, it recently launched a new store format that will be 50,000 square feet — considerably larger than its current stores. Nespresso gets with the times and installs wi-fi: Some patrons of Canadian Nespresso locations have complained that they lack in-store wi-fi — that’s about to change, with a partnership with Orange Business Services, which will be providing Nespresso with internet and wi-fi in more than 35 countries. Nespresso has launched an app that can be downloaded as well, providing immediate connection to Nespresso retail location wi-fi. This will provide patrons of Nespresso cafes convenient wi-fi — staff in the massive Toronto Nespresso flagship on Cumberland Street had said that the cafe’s lack of wi-fi was intentional and ‘European’, though it appears opinions have since changed. McArthurGlen Vancouver Outlets to Expand: Vancouver’s McArthurGlen Designer Outlets is going to be growing in size — the popular 243,000 square foot outlet shopping centre opened in the summer of 2015, and it’s planning to add a second phase with 78,000 square feet of retail space that is expected to open in the spring of 2019. The centre features a range of upscale retailers, including first-to-market retailer Lipault Paris, which opened its first Canadian location at McArthurGlen in July of 2017. The landlord is working with Teresa Spataro of brokerage RKF to fill the space. Retail Insider will now be regularly including these briefs as part of our expanding reporting mandate. For more information, contact Editor-in-Chief Craig Patterson at: craig@retail-insider.com.